Nominations for the 2018 Pirate FM Local Heroes Awards are now OPEN! Cornwall Glass is a family owned business specialising in the manufacture and production of glass and glazing products, serving commercial, trade, architectural and domestic customers for 40 years is delighted to be part of the awards this year. We have 15 branches that stretch from Penzance to Bristol, offering an extensive range of glass products and employing nearly 300 colleagues. Being part of our local communities is something that has grown alongside us and we support many worthy causes across Cornwall, Devon and Somerset. We have our own charitable Cornwall Glass Fund which has enabled us to donate in excess of £50,000 to charitable organisations and community groups. This year as part of our 40th Anniversary celebrations we are embracing our core philanthropic values, hoping to become even more involved in supporting those around us in need. 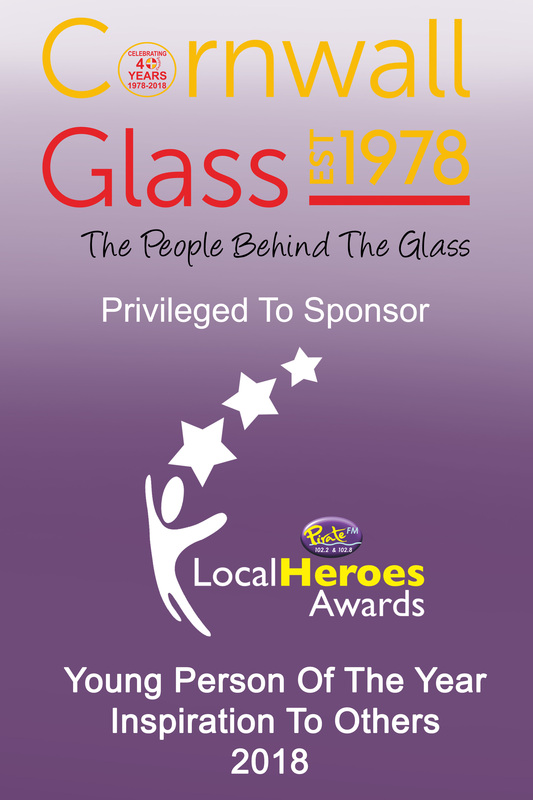 We feel privileged and delighted to be part of the 2018 Pirate FM Local Heroes, sponsoring the Young Person of The Year and Inspiration to Others Awards. Awarded to a young person who has demonstrated exceptional courage and maturity beyond their years. This award is to recognise a young person aged between 16 and 24 who has excelled in a certain situation. Do you know a young person who has battled against the odds to succeed? Maybe you know a young person who looks after a parent or has overcome personal adversity and always does it with a smile. If you do now could be the opportunity to share their story! Someone who has been an inspiration to others within the local community. This is for somebody whose actions inspire others in some way. We all know someone we look up to and admire – has someone made you change your life or think about things differently? It could be someone that has succeeded against all odds or somebody who is constantly helping others.